Ben McHugh and Cheryl Stern aren't quite the welcome wagon Liberty (Abigail Shapiro, center) was hoping for. “Liberty” is a winning Off-Broadway musical about an immigrant who arrives on American shores, only to be stymied by a political system tilted against her. It will spur memories of headlines we see every day … except this story is set in the mid-1880s. Aimed at young adults, but with appeal for New Yorkers of any age, “Liberty” chronicles the way ordinary Americans fought to secure the Statue of Liberty a place on her pedestal. It’s a twisty tale many of us were taught in grade school, though some of us—guilty!—could use the refresher course. Just how did that copper-and-cast-iron statue end up in the middle of New York Harbor? Yes, she was a gift from France, but wasn’t there more to the story? Indeed there was, and the musical’s creators, brother-sister composing team Jon and Dana Leslie Goldstein, have imagined an attention-holding saga to fill in the gaps. 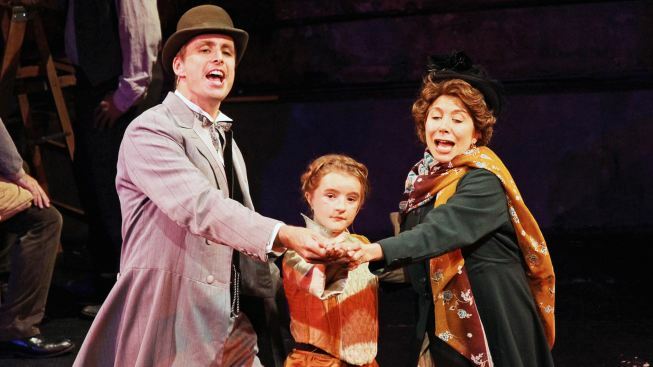 “Liberty” (the show’s full title is “Liberty: A Monumental New Musical”) starts with a father and daughter visiting the modern day Battery, then quickly rewinds as the duo transform into French sculptor Frederic Auguste Bartholdi (Ryan Duncan) and his “daughter,” the heroine of the title (Abigail Shapiro), a living, breathing and singing embodiment of the famous statue. America, in fact, has promised Bartholdi a warm welcome for his daughter, but challenges arise from the start, when an overcrowded boat means the patient young girl, like so many thousands of immigrants, will be traveling steerage. Tougher problems would come later: Just who is going to pay for a place to put Bartholdi’s gift? Talk about a torch singer. The charismatic actress, 14 years old, has the vocal control of a seasoned pro and a quiet stage presence that belies her years. Earlier incarnations of “Liberty” featured an adult actress as Liberty, but Shapiro’s audition spurred producers to change things up. Emma Rosenthal, a veteran Chicago performer, is a warm presence as poet Emma Lazarus, who mingles daily with the hoi polloi, teaching them English, while fearing what would happen if her wealthy parents were to know it. Ben McHugh provides the requisite oily sheen as Mr. Walker, director of the Census Bureau, a man with awesome power over the lives of arriving immigrants … and his sights set on bigger opportunities. On the subject of immigration, “Liberty” has a decisively open-arms stance. Walker voices his opposition in song, worrying “there won’t be enough to go around if the world docks at our pier,” and he’s clearly the show’s villain. Cozying up to Walker is a wealthy society widow named Mrs. Schuyler (Cheryl Stern, a Jonathan Larson Award-winning writer and vet of 2010’s Broadway “La Cage” revival). The two share a delightfully wicked duet called “The Charity Tango,” in which they warn Liberty against looking for handouts. Stern does double-duty as a Russian immigrant earning her keep as a pushcart peddler. Also carrying an extra workload: Tom Souhrada, as both an Irish construction foreman in charge of job assignments and newspaper baron Joseph Pulitzer, whose friendship with Liberty leads to the story’s satisfying conclusion. Ryan Duncan, C. Mingo Long and Andrew DiTusa round out the talented ensemble, who are directed by Evan Pappas, a Broadway actor who has starred in “Parade” and “My Favorite Year.” Pappas brings things in at 80 minutes, a sweet spot for school groups and fidgety grownups. Kids and teens will find inspiration in Liberty’s perseverance, but the musical operates on a different level for adults, illuminating the xenophobia that has met every wave of immigrants to America. The show is a welcome jumping-off point for a discussion about the ingredients that make America the multicultural bouillabaisse—to borrow Bartholdi's phrasing—it is today. “Liberty: A Monumental New Musical,” has recently concluded a run at Theatre 80 in the East Village and producers are working on an expanded Off-Broadway production. Visit libertythemusical.com for more information.